I honestly didn’t think it would happen, but Microsoft has given Xbox 360 backwards compatible games(Well, at least a few of them anyway.) visual upgrades for Xbox One X users. One of the games they showed off was Halo 3, a game that has not changed graphically in 10 years. Yet here it is, running with what APPEARS to be more detailed textures than it has ever had. People are claiming that the game has been remastered. Yeah, no, that’s false. No company went back into the game and replaced the old sub-1K textures with shiny new higher resolution textures. What people are seeing are actually the original textures, but presented how they were always intended to be seen. This is possible due to a nice little setting known as “anisotropic filtering” aka texture filtering. The lower the setting, the blurrier textures get. The higher the setting, the clearer, the more detailed they get. Final Fantasy XV saw this same kind of upgrade on PS4 Pro where it’s High Quality mode cranked up the filtering setting, making ground textures noticeably better without actually changing anything about the textures themselves. The same has been applied to Halo 3. So now it looks better without anyone really having had to do anything except flip a switch. Along with that anti-aliasing appears to be improved significantly and the games screen resolution has been bumped up. To what, they didn’t really say, only that there’s 9 times the pixels. It’s pretty much what the game would have looked like had it been released on PC even 10 years ago. 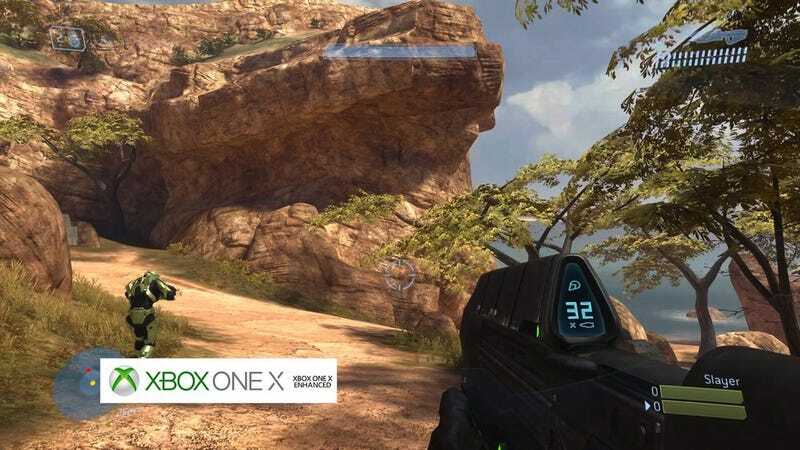 Whether or not this same sort of upgrade will be applied to Halo 3: ODST, Halo: Reach, Halo 4, and Halo: Combat Evolved Anniversary remains to be seen, and this presents a new question: Will this be the extent of the Xbox One X enhancements for the Master Chief Collection? I hope not, but at the same time I guess it’s better than having the same looking games, but now in 4K.